The Olive tree possesses a wealth of symbolism in many cultures - peace, fruitfulness, purification, strength, victory and reward. From ancient Greece, to all three monotheistic religions, the olive tree, branches and fruit are all held in special esteem. Today, peace is the most prevalent symbol attached to the Olive in the western world. The artists of Adina Plastelina have brought the art of shaping polymer clay to perfection. 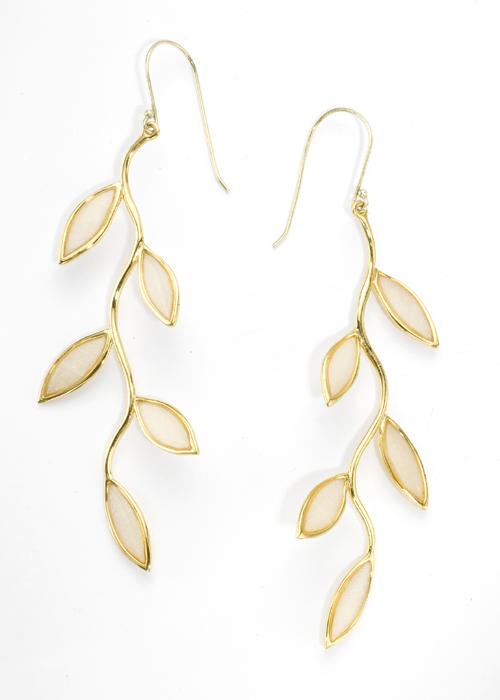 They have depicted the form of the olive branch in these beautiful gold plated sterling silver earrings, and filled the leaves with pearl colored polymer clay – to create earrings with an elegant and timeless look. Adina Plastelina specializes in the design and crafting of unique jewelry by means of the Millefiori process. Millefiori is the combination of the Italian words Mille (Thousand) and Fiori (Flowers), a term used for the first time around the 1850, yet the process itself has been in use for about 2,000 years.Now, two thousand years later, the talented craftsman of Adina Plastelina, have revived this technique and applied it to Polymer Clay. The play of colors, shapes and patterns, joined together with materials such as silver &amp; gold, transform these pieces into handmade, individual works of art.